Seasonings/toppings of your choice, e.g. cinnamon and sugar, coarse sea salt, poppy seeds, chilli flakes etc. 1. Heat the milk in until it is warm but not hot, pour it into a mixing bowl and sprinkle on the yeast. Leave for 2 minutes. 2. Add the brown sugar and 1 cup of the flour and mix well with a wooden spoon. Leave for 2 minutes, then stir in the brown sugar and 1 cup flour with a wooden spoon. 3. Cut the butter into small pieces of mix in along with the remaining flour and salt. You will end up with a sticky dough. 4. Tip the dough onto a floured surface and knead for about 5 minutes. It should be smooth but still slightly tacky, you may need to add a little more flour if it is too sticky to work with. 5. Shape into a ball, place it into a greased bowl and cover with cling film. Leave it to rise for about an hour until it has doubled in size. 6. Preheat oven to 200C/400F. 7. Punch the dough a few times to deflate it, and tip it onto a lightly floured surface. 8. Divide it into 6 pieces (for accuracy, do this by weight). Roll each piece until it is about 50cm long – I did this through a mixture of rolling it on the surface, and holding the two ends and bashing it on the counter while gently stretching (this is where you find out if your dough is elastic enough!). 9. 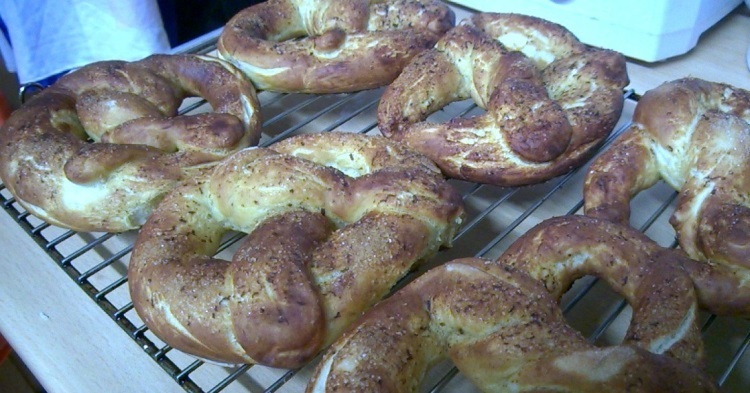 Twist each one into a pretzel shape. 10. Grease a large baking tray. 11. In a shallow dish, stir the baking soda into the warm water. Individually dip each pretzel into the baking soda solution ensuring it gets wet all over, and place on the baking sheet. Allow a little expansion gap in between each one. Sprinkle your choice of seasoning/toppings on each one, I used cinnamon and sugar on these, or leave them plain. 12. Bake for 10-12 mins until brown, transfer to a cooling rack. These are best eaten the same day if you like the crispness on the outside. Oo, these look so good and easy to make. I’ve always enjoyed pretzels but can’t quite stand the extra-greasiness or extra-saltiness of the franchise kind. Thanks, Vanessa! I will try this one and let you know how they turn out! Yes, these are neither greasy nor over salty, but they still have that mall-pretzel taste. The first batch I did I left plain and I liked them like that actually, but my daughter requested cinnamon and sugar so I did that with these. I’d like them a bit less chunky though, so next time I might divide the dough into more pieces and make thinner pretzels. 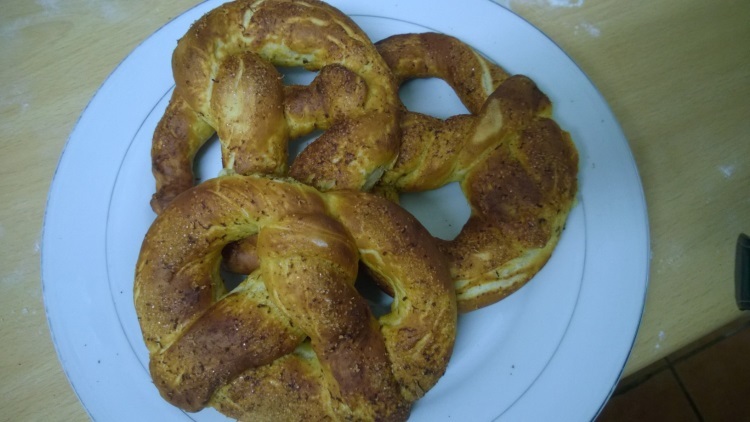 Pretzels do have a distinctive taste to them don’t them that not everyone likes. Did you know that the proper ones use lye rather than baking soda on the outside! You’re supposed to use a breathing mask and gloves if you use that method, so I didn’t really fancy trying that! It’s only in recent years that pretzels have become more well known over here, we’ve always had the small crispy ones in bags, but not the big soft ones, I think when I moved to the states in 1997 that was the first time I came across them. Now we have them in all our malls too!